She has 1.4 million followers on Instagram. She has modeled for Prada. She has released her own album on Spotify and receives nearly 250-thousand monthly listeners. She has appeared in Paper Magazine. Accounts have sprung up all across Instagram imitating her. YouTuber Shane Dawson has received millions of views doing videos about her. And she isn’t even a real person. If you haven’t guessed who we’re talking about already—It’s Lil Miquela, the most famous CGI Instagram influencer who caused a frenzy in the social media world over whether or not she is a real person. 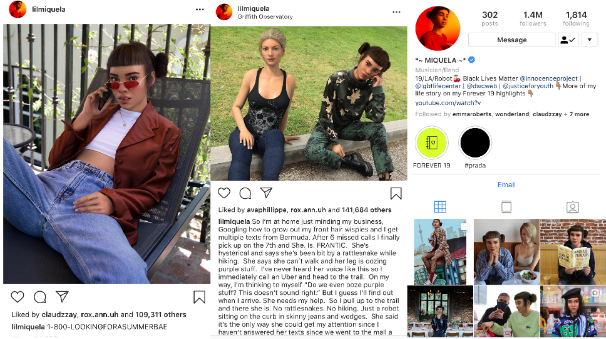 It turned out Miquela is not a real person—surprise! But her influence and presence entirely are. Her popularity has led to the company that created her, BRUD, to introduce new CGI influencers similar to her, and independent CGI Instagram accounts are attempting to replicate her success. Barbados revealed to us that he is indeed an actual person, and his name is Martin Brenkus who, FYI, looks nothing like Barbados. Brenkus lives in Slovakia and works in online marketing. He says creating a photo of CGI model Barbados can take around 4-5 hours, and it requires making a digital body and editing details in photoshop. The scenes are real, but Barbados isn’t. When you look at the photos Brenkus creates of Barbados you can see how some people may find him appealing. With tan skin, sharp cheekbones and a muscular physique, Barbados definitely has all the features of a good model, even if he doesn’t look entirely real. It makes sense how a Barbados, or a Lil Miquela, can appeal to a target audience. Started by the partnership of Irma Zucker, an ex-model/dancer, and Phillip Jay, a digital artist, Irmaz sees CGI as an entirely suitable alternative to human models. It’s up to you whether you find their models “perfect.” Some of us Jerks found them a little creepy… but it’s this eerie idea of perfection that makes CGI models a thing in the first place. It’s also what makes them so controversial. Instagram already has issues with making people feel bad about themselves. In a ranking of the effects of social media on mental health, Instagram came up as the worst app for young people’s mental health in a study done by the Royal Society for Public Health.The study notes that Instagram and Snapchat, which came up as second worst, are both image-focused and appear to be driving feelings of inadequacy. If people are already feeling inadequate when comparing themselves to real people, how are they supposed to feel when their feed starts filling up with “perfect” CGI models? However, Grygiel sees more issues with CGI influencers than just people comparing themselves to them. We reached out to BRUD about this topic, but they said they are not taking interviews. However, if the success of Lil Miquela is any indication, Grygiel is right. “AI is a coy way to make it more flashy. They mask it to make her more intriguing,” Grygiel said. Part of Lil Miquela’s whole shtick is that she is a “relatable” robot. She makes posts talking about being a Taurus, enjoying In-In-Out and going to the movies. If she’s merely a computer-generated-image, this whole aspect of her would ruin even more of her credibility as a genuine human… computer… robot? Perhaps though, that’s what should happen. 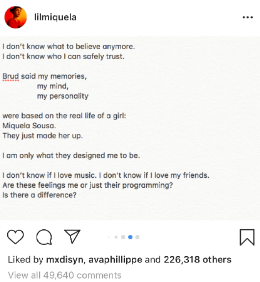 If Lil Miquela isn’t an AI, then she should stop pretending. If her followers still decide they want to follow the fantasy-life of a computer-generated-image,then that can be a choice they’re actively making, rather than being tricked into. Reality is already spun on the internet so much with fake news, photoshopped pictures and CGI influencers. Let’s at least have the CGI influencers be open about not being robots. That way when the real robot influencers/models come along they don’t have to fight this battle. Comment below with your thoughts and concerns. Do you think this is the future of modeling?